Made with love, for my love. This week I finished a very special quilt. The colour orange is his favourite and until I started making this quilt, I barely had an orange fabric in my stash. 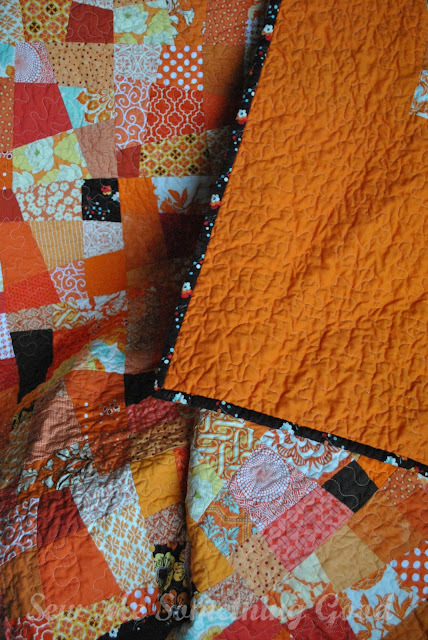 Knowing how much he would appreciate his own quilt to wrap up in when he's working at his desk in the evenings, I embarked upon gathering an array of orange fabrics. 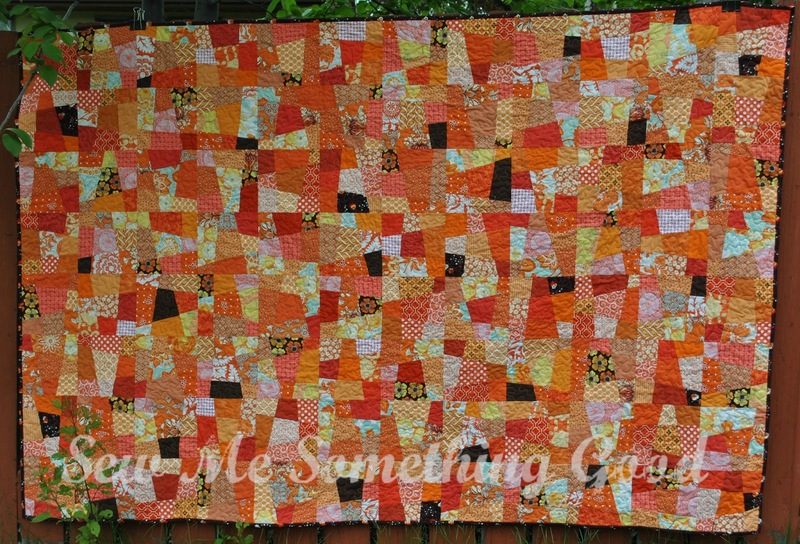 I used Elizabeth Hartman's Crazy 9-Patch block tutorial to make the ManDarin quilt. 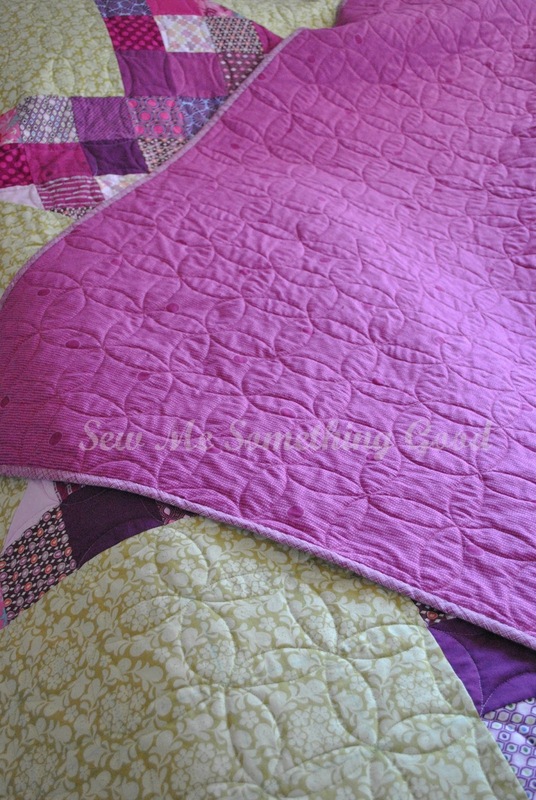 From the beginning, my husband knew I was making this quilt for him and I would ask for his preferences. 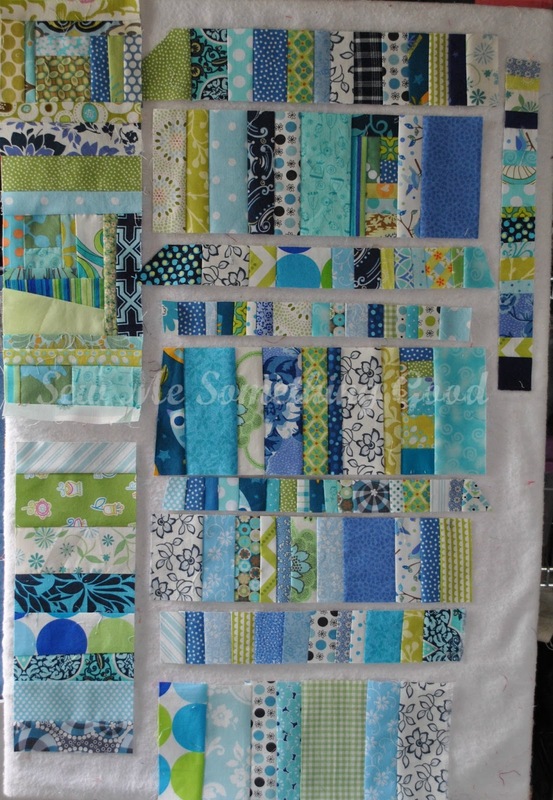 He wanted those crazy 9 patch blocks all tossed in together with nothing else to break them up. 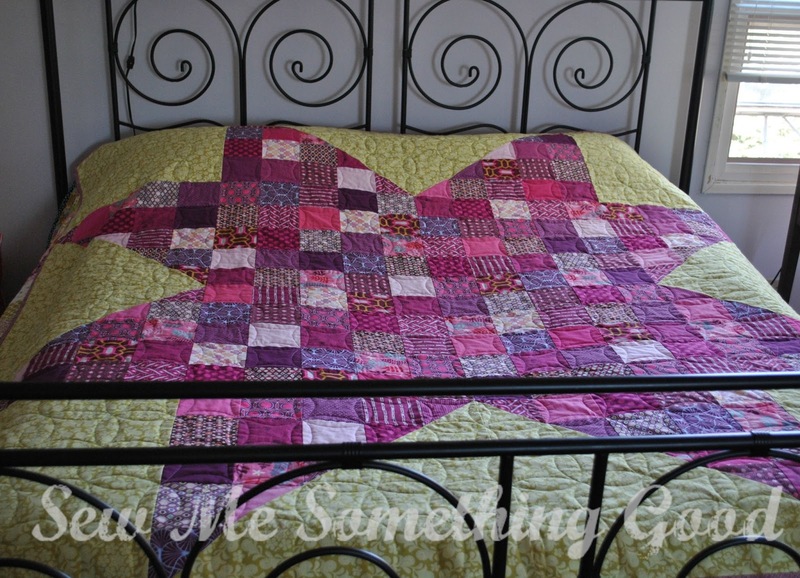 The odd hit of brown thrown in to keep your eye moving over the quilt was a fun addition. I sewed block after block. I think I got a bit carried away! 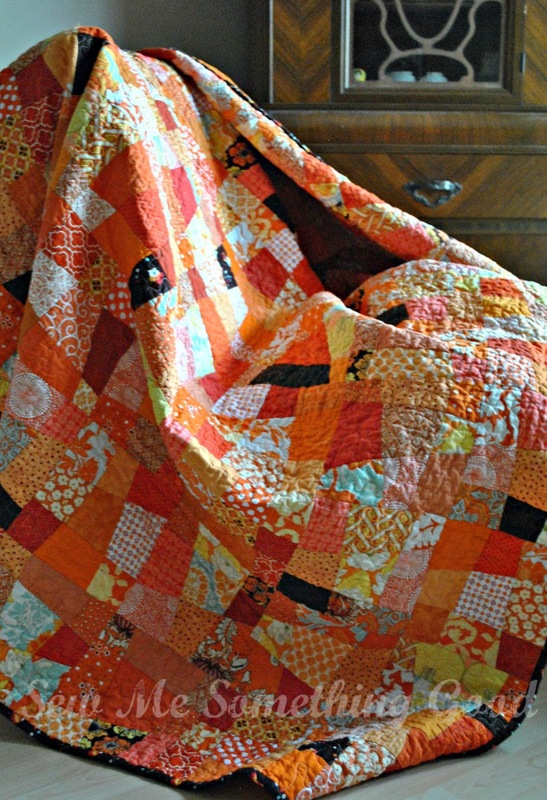 I wanted his quilt to be large enough to wrap him up - mission accomplished. In fact, I sewed more than enough for the quilt top, so the extras found their way onto the backing. Personally, I love the back a wee bit more than the front (but don't tell him ;o). I like the blocks framed by the solid. Maybe it's because it gives the eye more of a resting place? Still, I couldn't be happier with the finished results. Since the quilt is quite busy with so much colour and print, I opted for a meander stitch for the quilting. 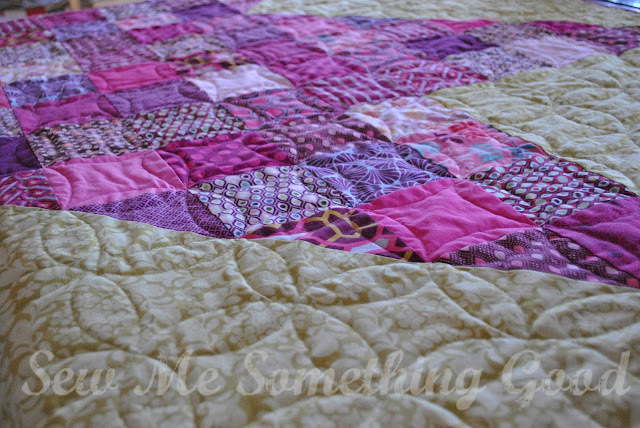 I figured about all my quilting would contribute would be some texture. I think I was right! 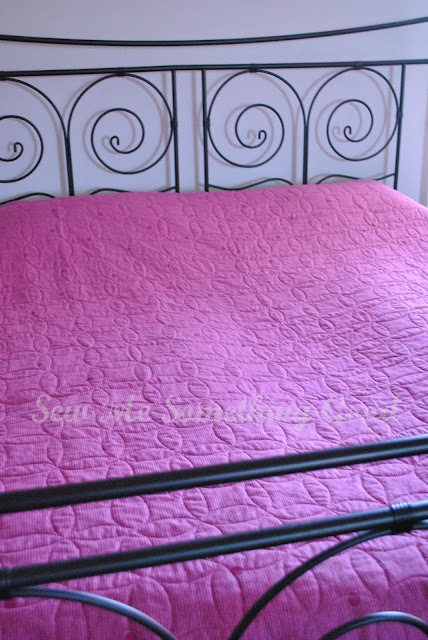 Compare for yourself, the before (above) and after (below) of the texture my quilting provided once I laundered the quilt. I used a light orange Aurifil thread in 50wt and fell in love all over again with this thread for FMQ. My machine seems to prefer it, too. No annoying tension issues with this thread, which makes for an enjoyable quilting experience. 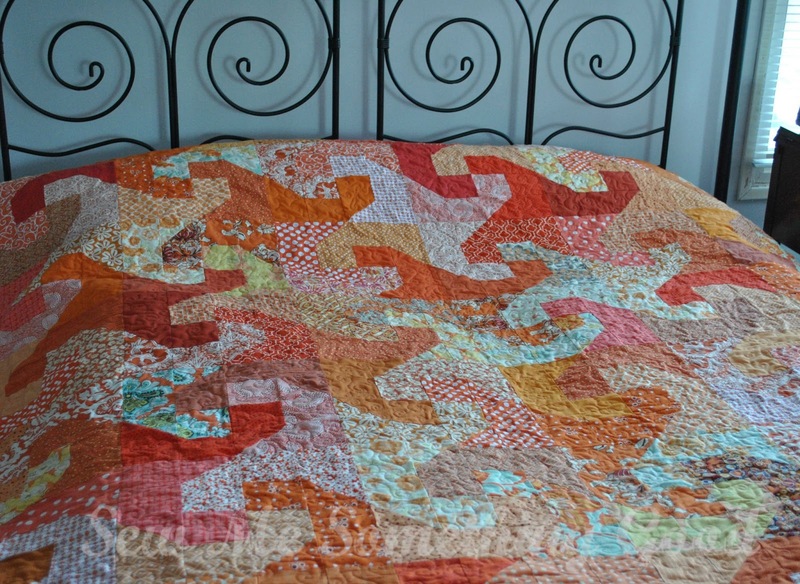 Fresh from the dryer, I presented my hubby with his quilt and the look on his face was the icing on the cake. 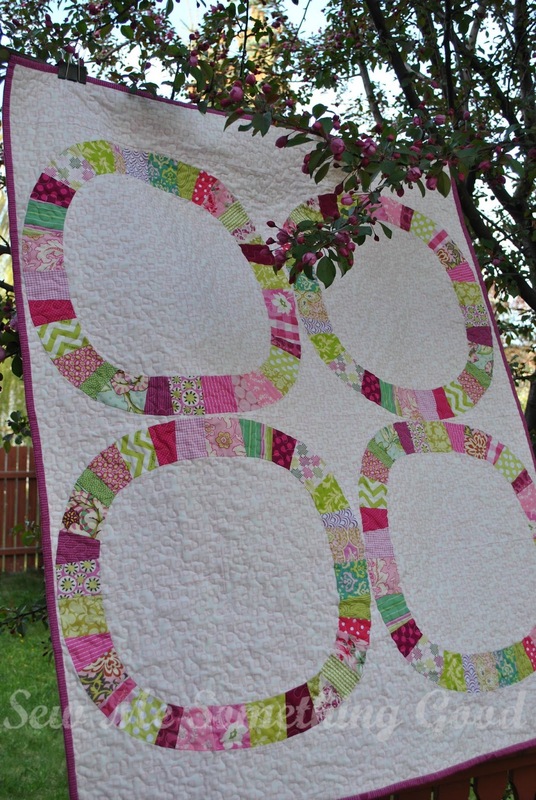 This is why I quilt. FAL list for the second quarter of 2013. 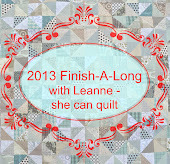 I'm linking my ManDarin quilt to Amanda Jean's Finish it up Friday! The quilt we'll be making is Rachel's pattern, Impromptu. 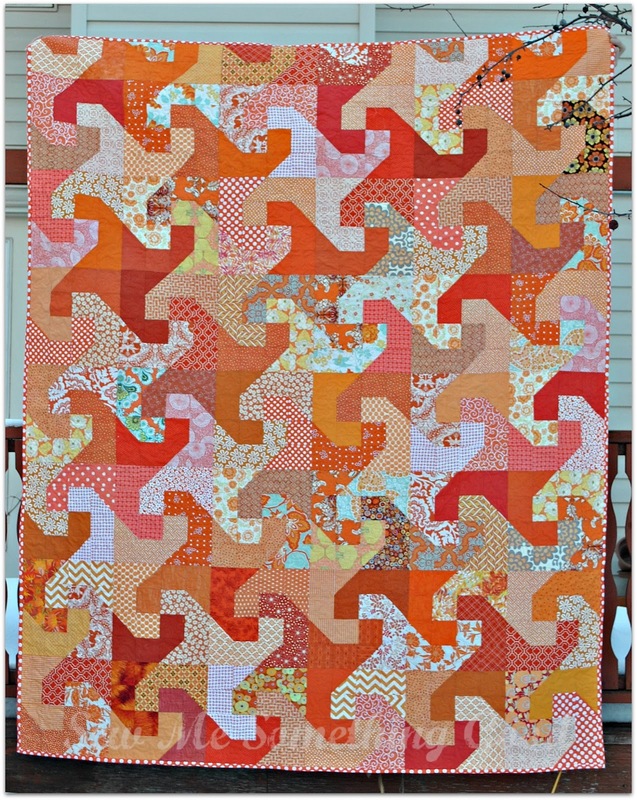 I've purchased the PDF version of her pattern and have started auditioning fabrics. This pattern works beautifully for layer cakes, but I've decided to use some treasured charms that a sweet friend gave me. 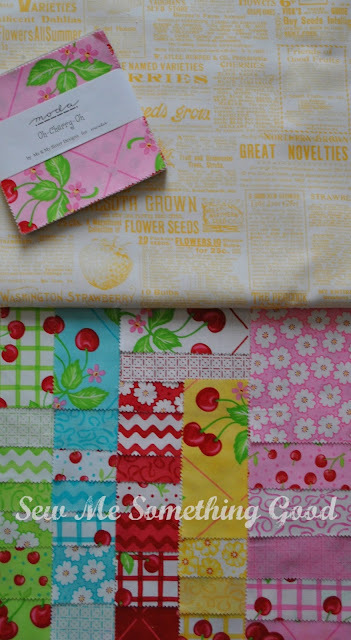 Besides those charms, some 10" squares are needed for the blocks, so I'm pulling colour.... and more colour from my stash to fulfill that fabric requirement. I'm still auditioning, so not sure which of these will make the final cut. I wonder how long I will hold out before the cutting begins. ;o) I can't wait to get started! hop on over to Katy's blog for all the details. only needs a quilt label before I send it off to her (something similar to the label I made for this quilt for her sister). My days of the week are all jumbled up, thanks to having a job that was scheduled for the whole weekend. A bit of a mix-up and a looming deadline conspired to have my hubby and I installing all weekend. Yet, surprisingly, here I am, home for my Sunday ( last evening, sweet husband said I should stay home today while he would go back alone). It's been a busy week for us, with some very long days, so I'm more than ready for a break - which I know he is ready for too. Neither one of us is a fan of working the weekends, because we recognize the importance of having "down" time. Time to relax, time to recharge and time to do other things besides work to pay our bills. No one gets to the end of their life, looks back and says, "I regret not working more". Work is always there, there's always more to be done, but if no time is given to play or just "being", I find I burn out. Creatively, emotionally and physically. 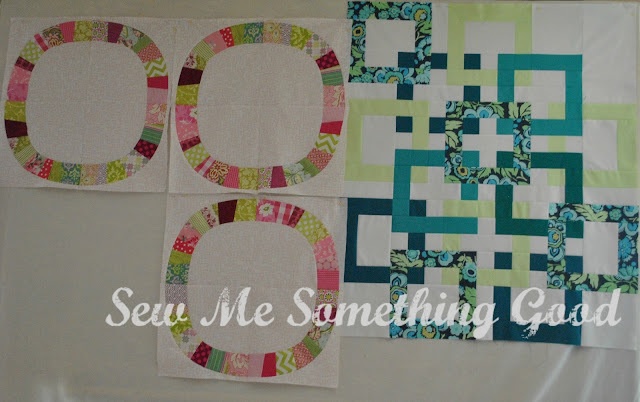 Sewing can be playing? Definitely! Take this work in progress as an example. I've yet to figure out how I will make it all come together, but I'm enjoying the chance to sort it out as I go along. I'm just playing and it's making me happy. So today, I'm going to "play". How do I play? 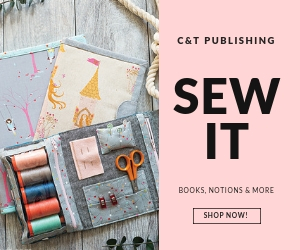 I take time for regular exercise, time to read a inspiring book, time spent with my sons (since it's sunny, a walk through the woods sounds perfect) and some time spent sewing. 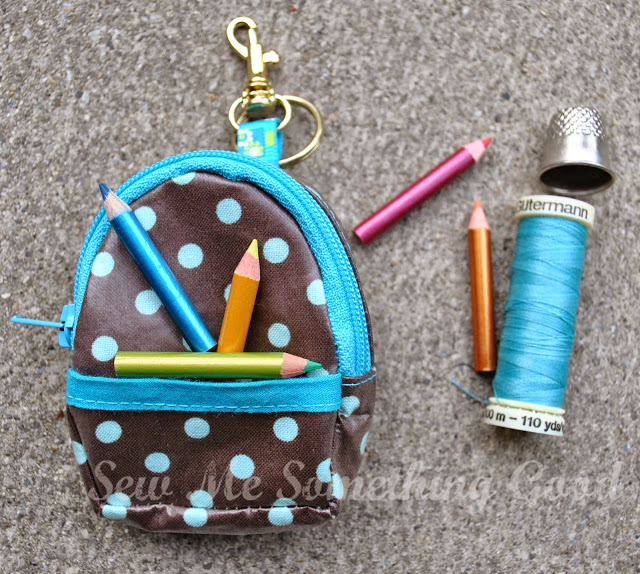 See how I'm taking time to nourish my physical, emotional and creative needs through play? Wishing you some happy play days! Baby Quilts category for the Blogger's Quilt Festival. 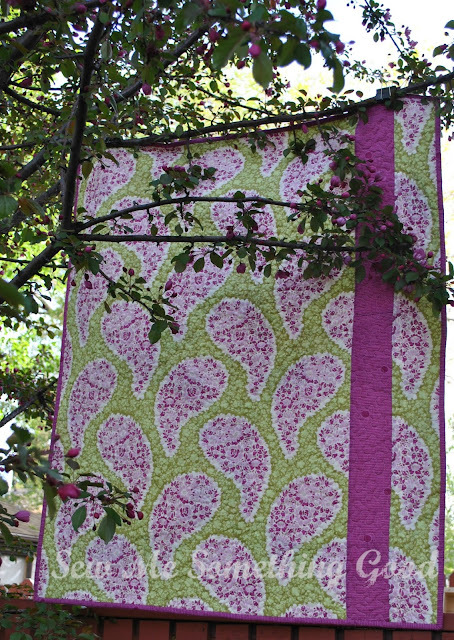 My timing on finishing this quilt also happened to line up perfectly with a tree that is just starting to bloom (making for an extra fun photo shoot ;o). Denyse Schmidt's Single Girl pattern has been calling to me for ages and since I may have a new niece any day now, I found the perfect reason to grab some pinks and greens from my stash to make this quilt. As I mentioned in an earlier post, I used freezer paper to make it easier cutting out all those pieces for each ring. I would highly recommend this method if the prospect of cutting and tracing out templates is making you hesitate in trying this pattern. Sherbet Pips Play Dot in Vanilla made for the perfect background fabric to set off those scrappy blocks. Since this quilt is for a baby and will definitely be washed often, I decided to stick with a dense meander quilting to make it more durable. 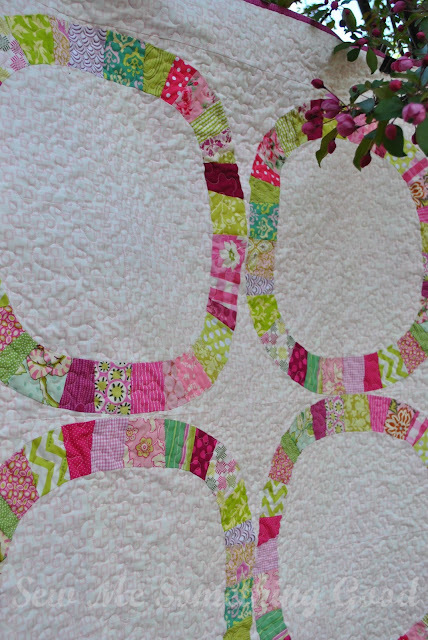 I couldn't resist using this print from Sandi Henderson's Secret Garden collection combined with a strip of Ladder Dots in Fuschia from Denyse Schmidt's Chicopee line. I debated a bit on using something more traditional, but loved the fresh, modern look these fabrics give together. 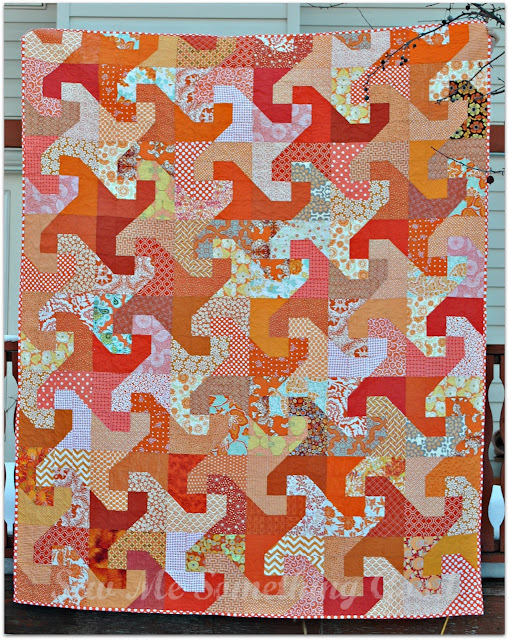 My Cherry Blossoms Baby Quilt finishes at 42" x 50"
Huge thanks to Amy for all she does to make the Blogger's Quilt Festival happen. I love that she's given us categories to organize our entries into. Thanks Amy! It's been a wonderful week full of viewing gorgeous quilts and discovering new blogs. What a great event! I'm linking up my quilt finish this week with Amanda Jean's Finish-it-up-Friday. 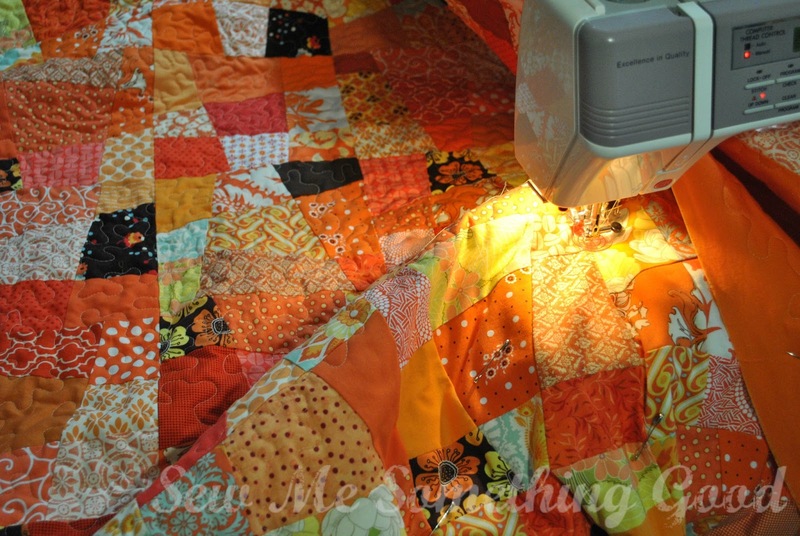 Quilting like crazy on the ManDarin quilt (which is on my FAL list) for my hubby. 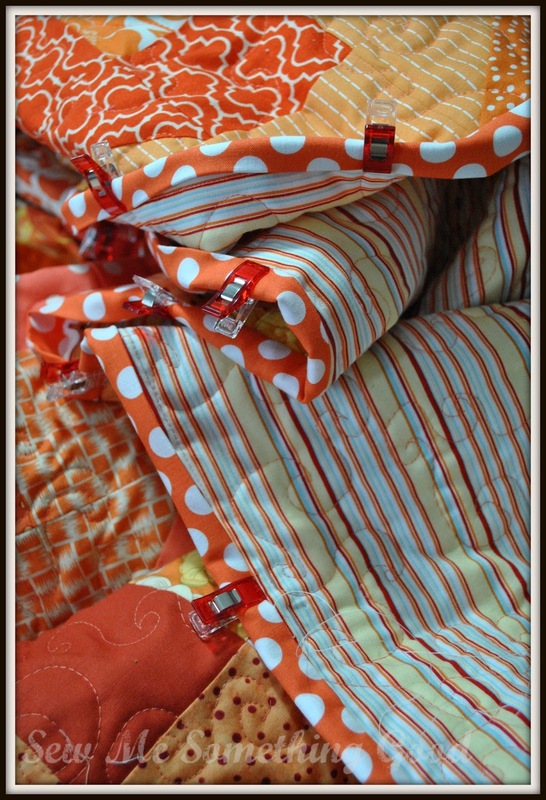 Just to mix things up a bit this week with my sewing, I made a foray back into a scrappy project I started earlier this year. It just so happens that I added this project to Q2 of my Finish-A-Long list, so progress is definitely needed. I really enjoy letting the scraps lead me - basically, this means I just look for similar sized pieces and stitch them together. I keep an eye out for mixing colour value while limiting my palette to blues and greens. 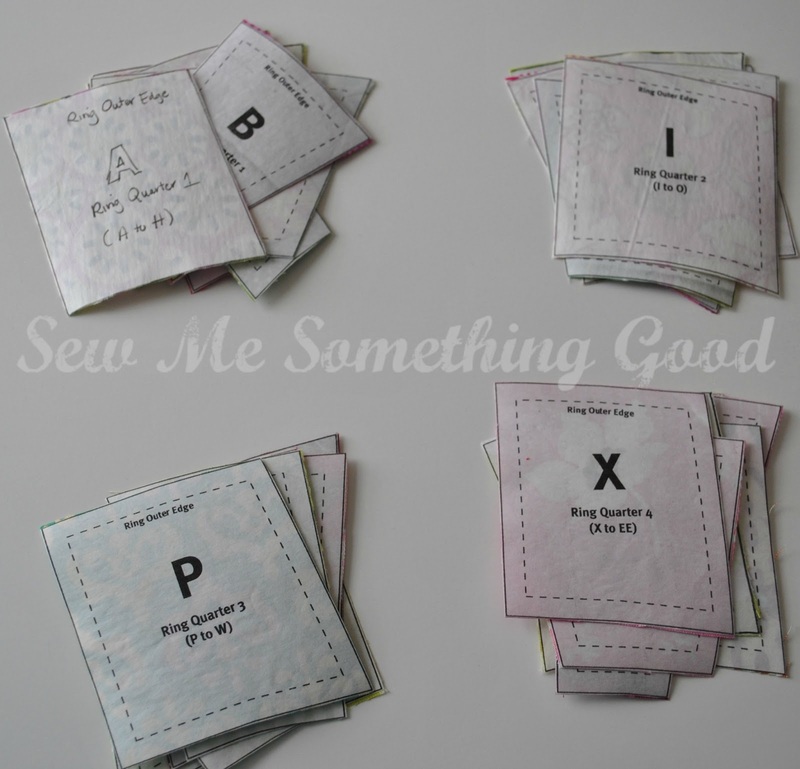 It's a bit like putting together a puzzle, but it adds up to easy stitching and fun results. I love seeing these tiny pieces become something larger and cohesive. 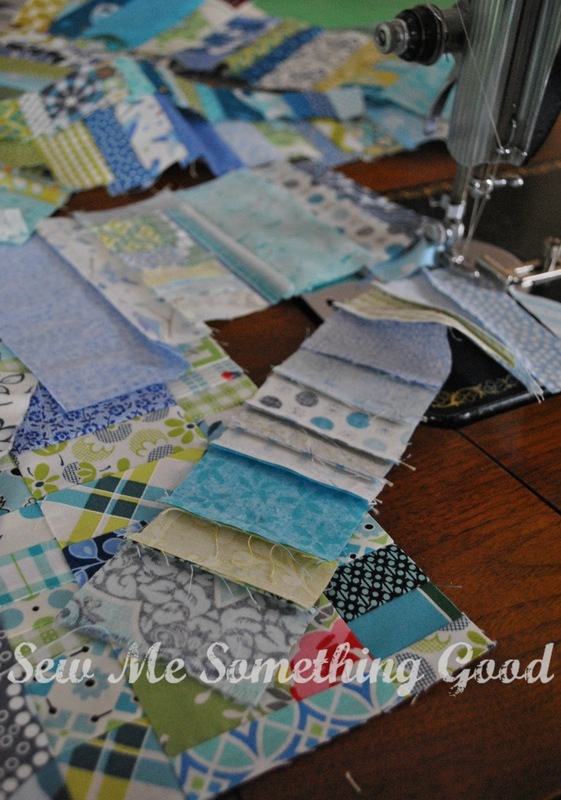 Scraps are treasures when it comes to patchwork! 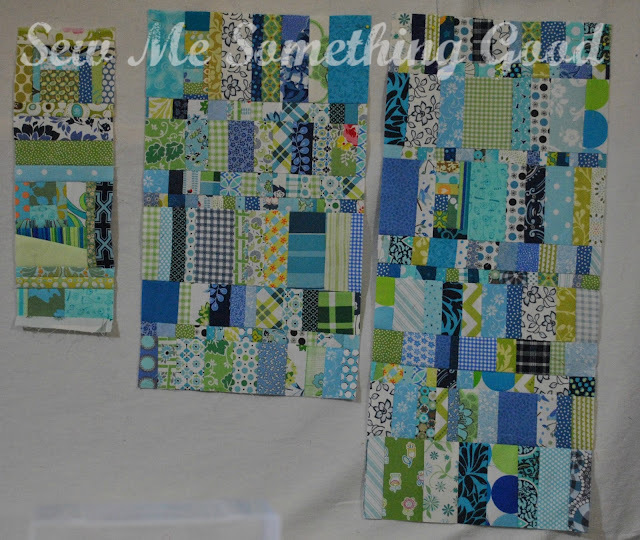 My latest strips will find their way into being used with the first section I put together back in Feb. (shown in photo, below) I haven't quite sorted out how all of this will be combined and I am still debating on whether to make this into a small quilt or whether I should just make a mini to have in my sewing room. Warm sunny days have me daydreaming about the summer ahead. 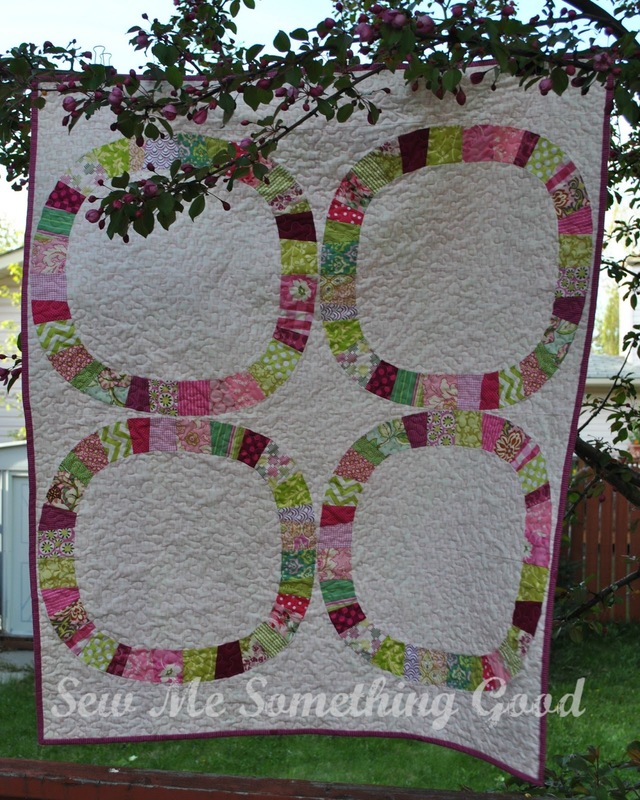 Sew Fresh Fabrics as a part of this contest. Summer is all about the outdoors for me. Camping, hiking and floating down a lazy river are favourite activities to enjoy with my family and with any luck, this summer will see me doing all of these things. 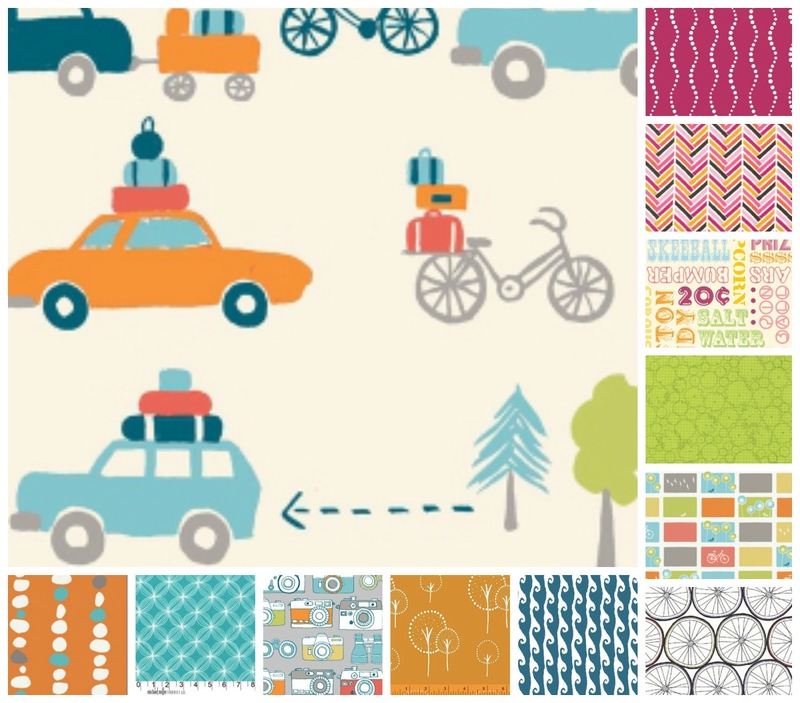 Can't forget biking and visiting summer fairs! Sounds pretty good, doesn't it? 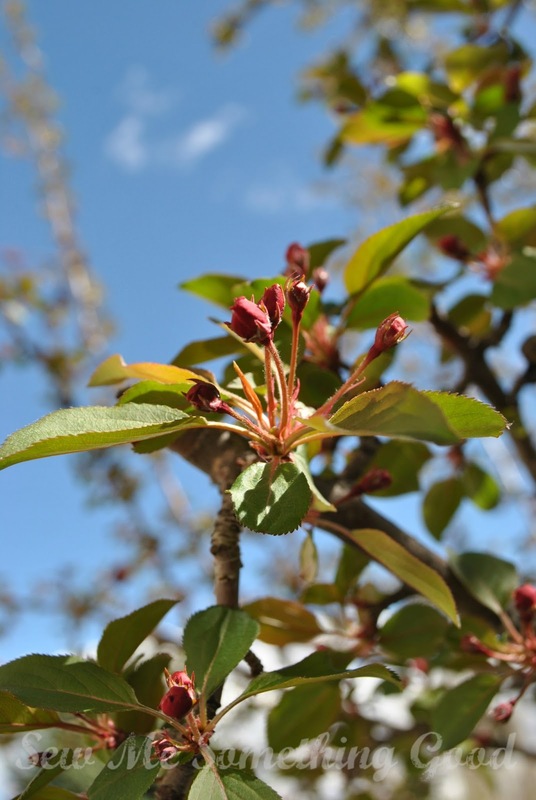 What do you enjoy doing in the summer? If you're interested in seeing other summer bundles, click here, and if you want to create your own bundle(s), you have until the end of May to enter. Details for the contest are HERE. Hi there ! If you are visiting my blog for the first time while touring the Blogger's Quilt Festival, welcome! 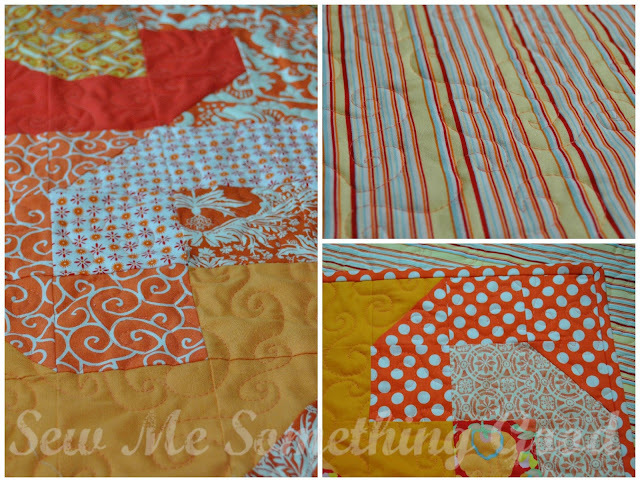 The quilt I'm sharing is a recent finish, so those of you that are not new to my blog will recognize it as my Orange Twirl quilt. 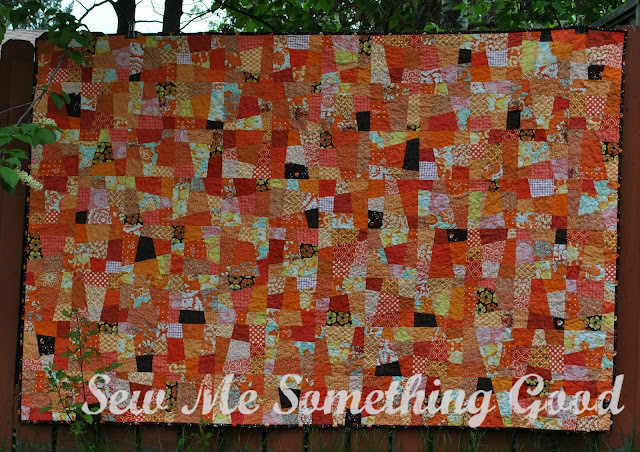 It measures 71" x 90" and started out as a way to use up some leftover orange fabrics from another quilt and try a new block design. 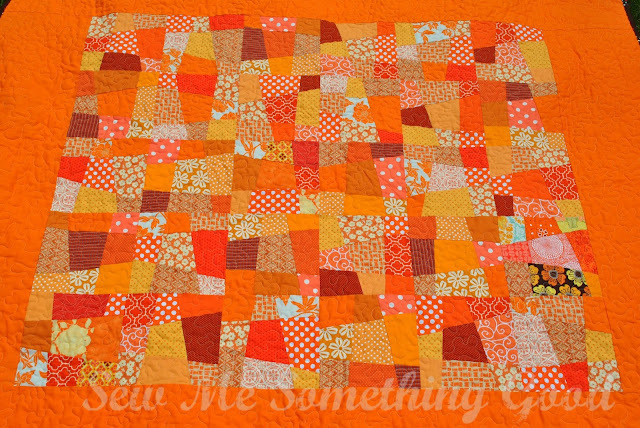 Little did I know that this simple block and playing with fabric values in orange would captivate me! The more blocks I made, the more I fell in love with this design. It didn't take me long to realize that I would like to make the quilt bed-sized. That presented a problem. 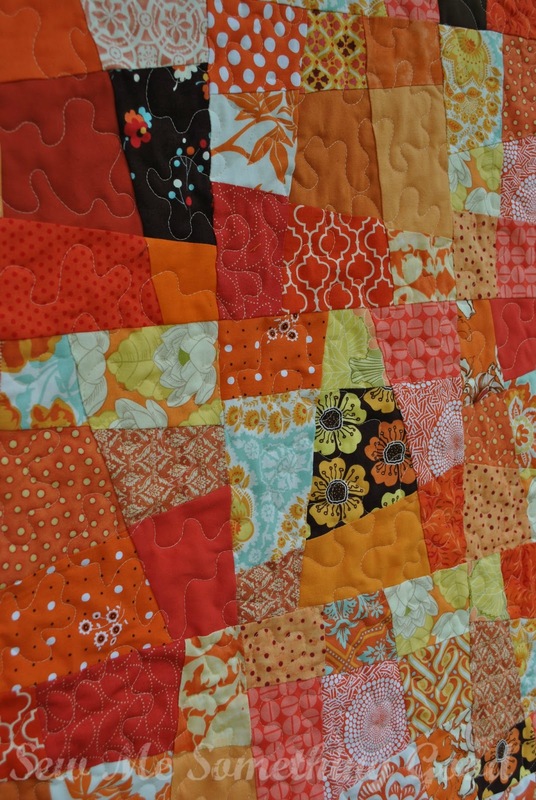 I needed to keep the values contrasting in the quilt, but my collection of orange fabrics was getting slim. 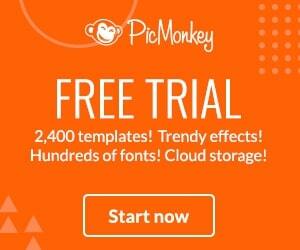 That's when some wonderful blogging friends stepped in to help me out. 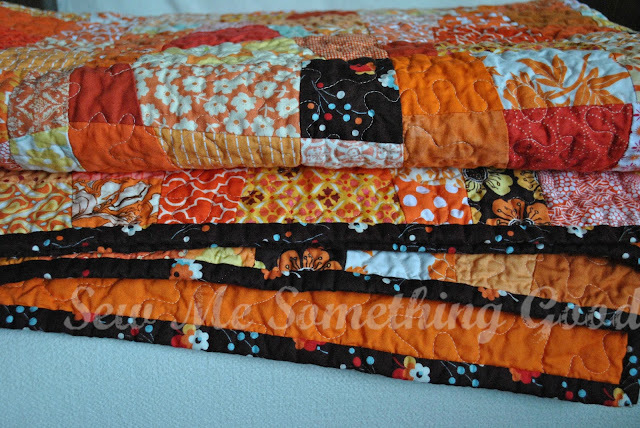 I think of their generosity as "Orange-Aid" and their kind help, made my quilt more lovely than I had imagined. My next challenge turned out to be my quilting. Instead of ripping out all my stitches, I walked away from it. 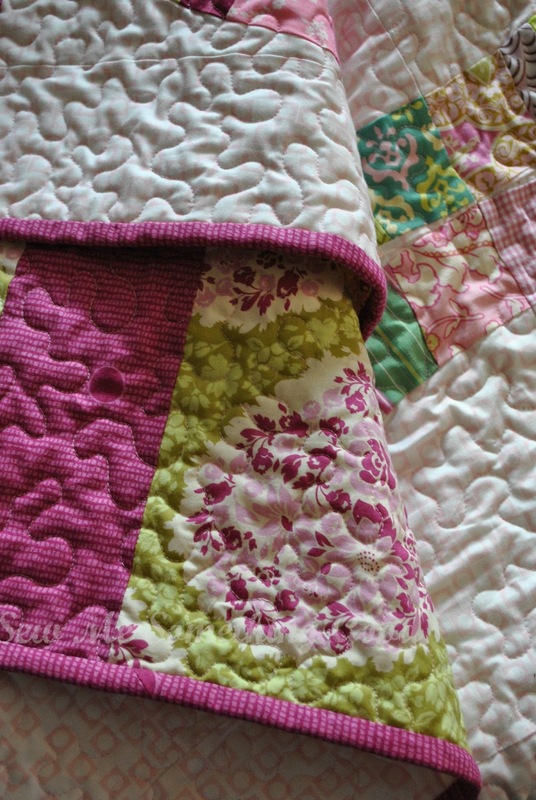 I realized the swirly quilting wasn't quite as disappointing as I first thought. Sometimes, as was the case with this quilt, it's the fabrics that take center stage, not the quilting... and that's good. 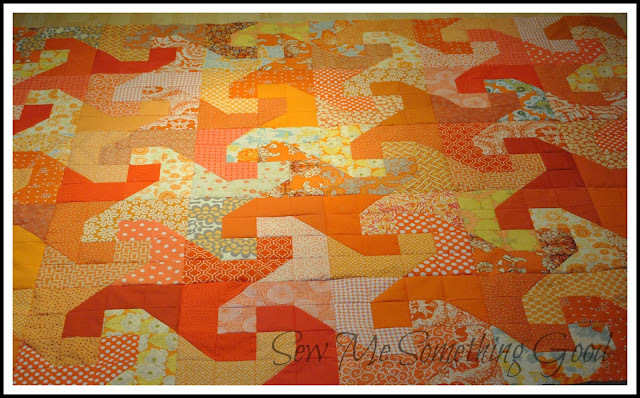 The rest of the quilt came together smoothly. Using a stripe fabric for the backing was a first for me. Using dots for the binding... was not a first, but is always a favourite. I would never have guessed that my initial motivations (where's the risk in using leftovers to try a new block, right? ;o) would result in a quilt that makes me smile every time I look at it and give me a whole new outlook on a colour that I used to overlook. You're always welcome here and I hope you'll click my "follow with Bloglovin" button (sidebar) to keep coming back. Okay, off you go! Have fun visiting everyone else in the Festival! Today, mundane (but necessary) things like laundry, cooking and cleaning topped the to-do list. Yes, I now have 3 blocks complete for my Single Girl baby quilt. 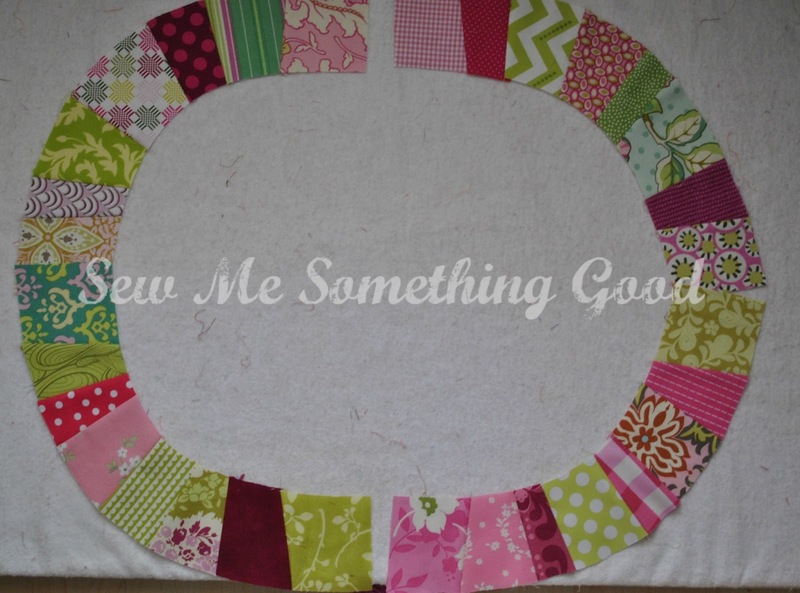 I can hardly wait to finish this girly sweet top! Garden Plot (which is awaiting finishing). 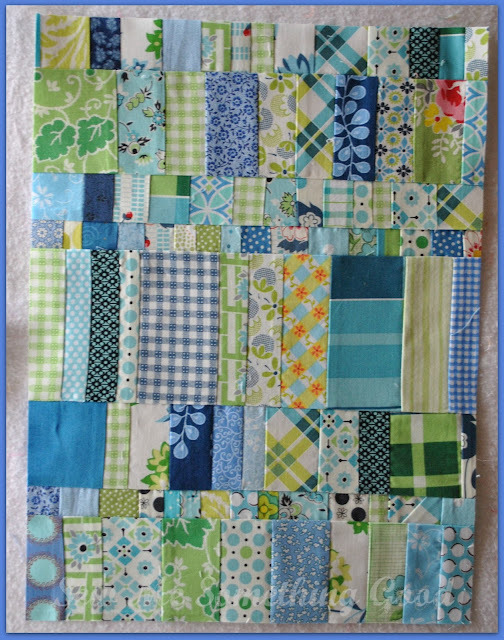 Throwing Setting aside (for the moment), my many other sewing projects, I'm stitching like crazy on the baby quilt I started on Mother's Day. I'm using Denyse Schmidt's Single Girl quilt pattern with assorted pink and green fabrics from my stash. 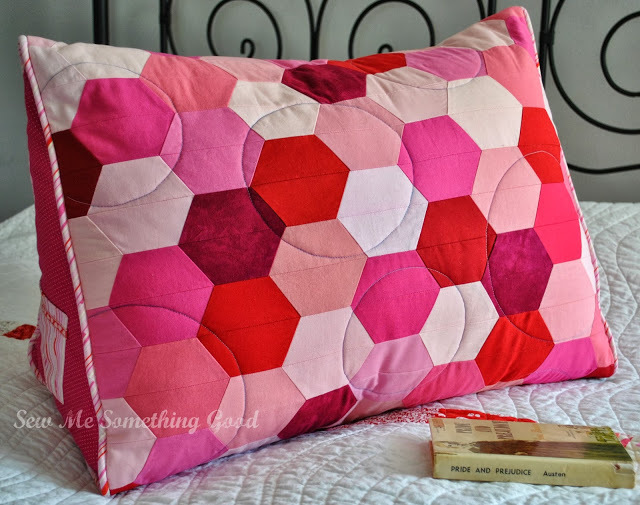 The last time I pieced curves was for my One Heart Reading Pillow. Partly due to the fact that I don't have any template plastic on hand, (for cutting templates from plastic and tracing around them on my fabric), and partly because I'm lazy... I came up with another idea. 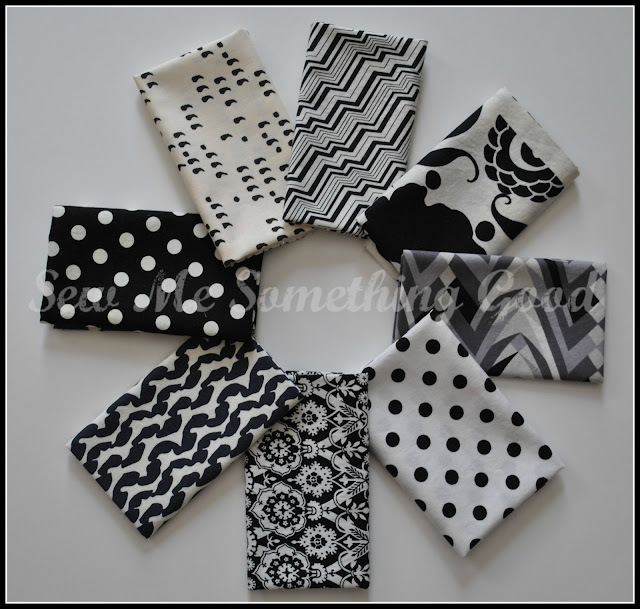 I photocopied all the small pattern pieces and traced the larger pieces onto freezer paper. This allows me to iron the pattern piece onto the fabric for ease in cutting (no pinning or tracing necessary!). It also worked brilliantly for keeping those pieces organized for stitching. 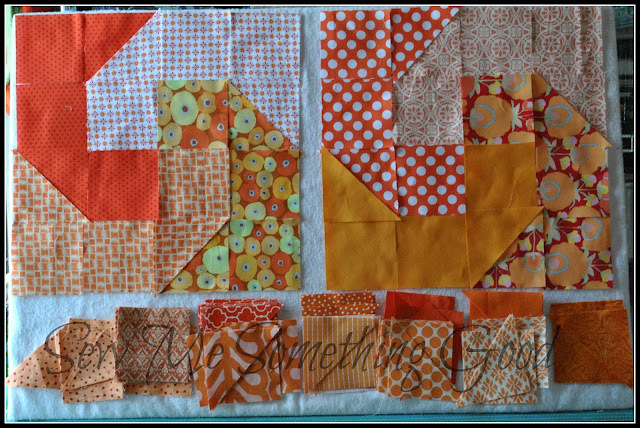 Pieces cut and organized by quadrant for one block. 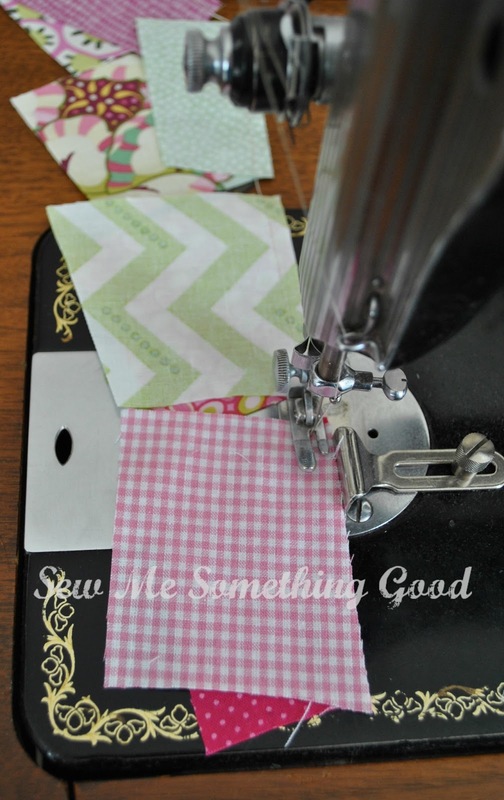 Makes for easy chain piecing. 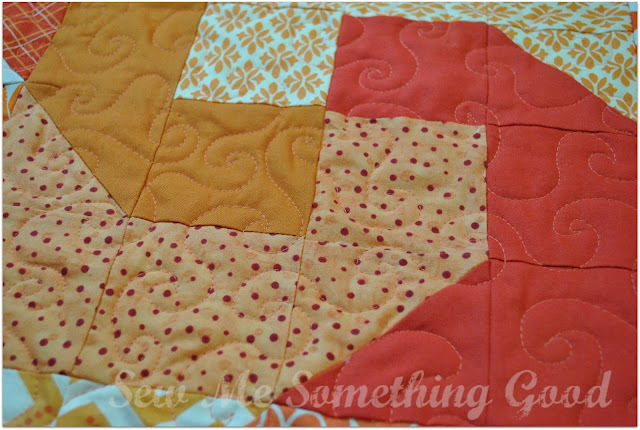 The next potentially tricky bit to this block design, is sewing those curves. 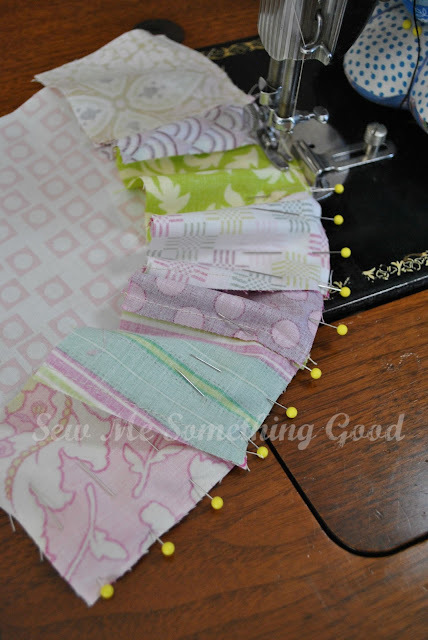 Following the pattern instructions, pins are the way to go with making those curved seams align without struggle. Sewing the inner circle seam line for one quadrant. 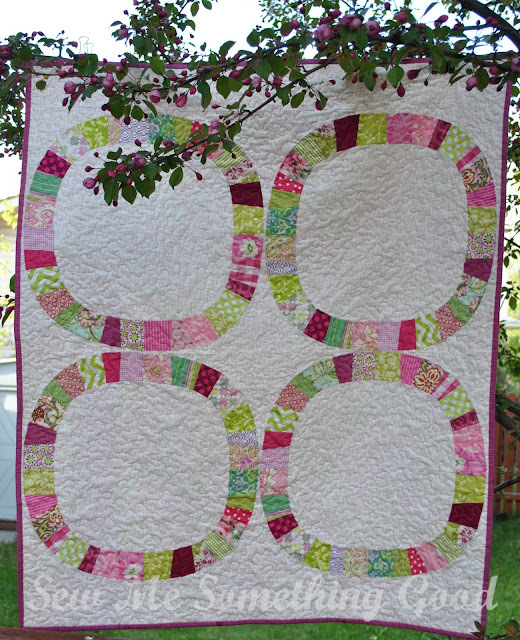 Sherbet Pips Play Dot in Vanilla is too perfect not to use solely as the background. Two blocks done, two to go! I realize just how much Nature can affect my palette choices. 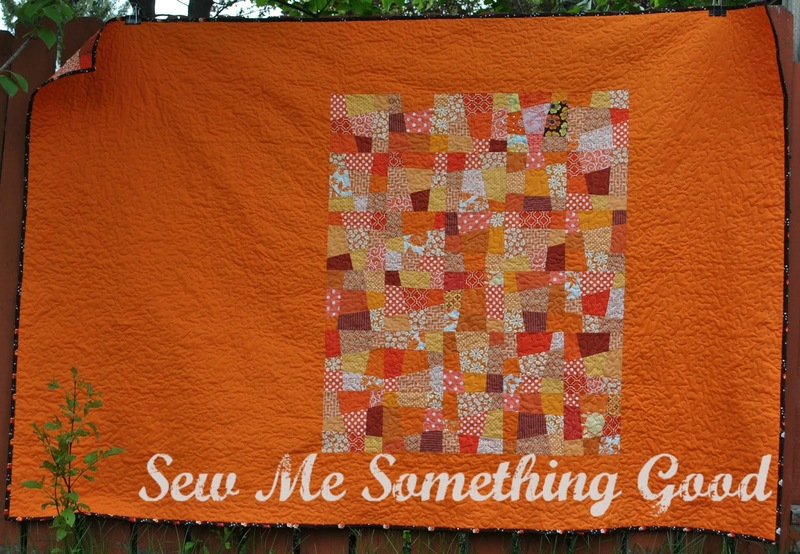 have me stitching up a storm in anticipation of wonderful news. 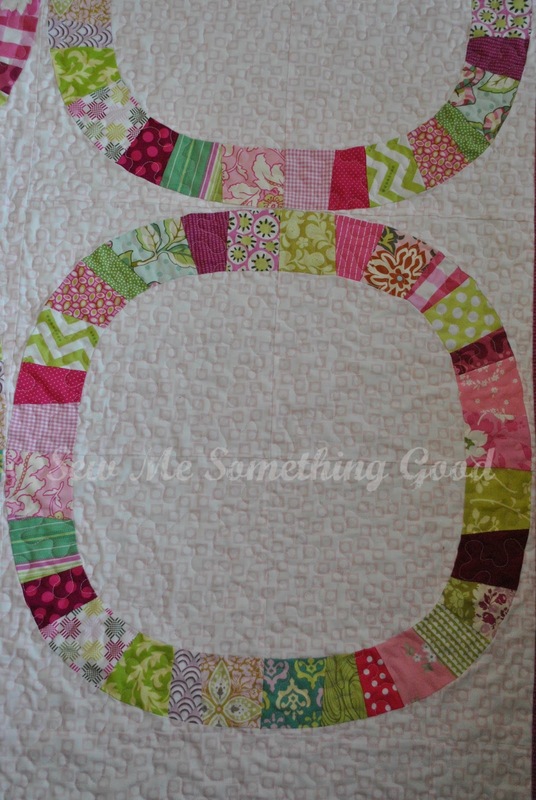 This month will bring the arrival of my newest niece or nephew. 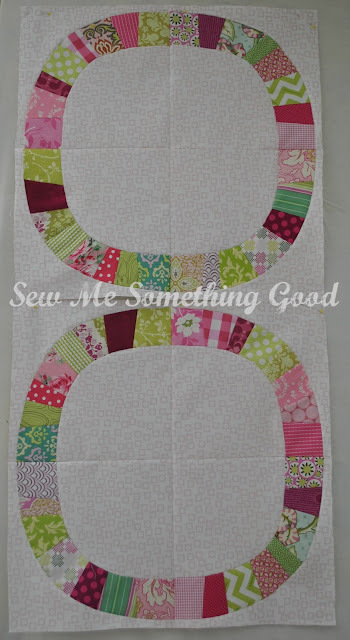 I probably should wait to sew anything gender specific until after the babe is born. 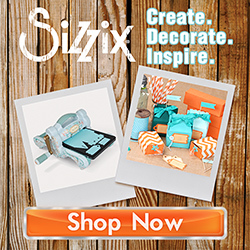 I've sent you an email to get your mailing address to send your prize. 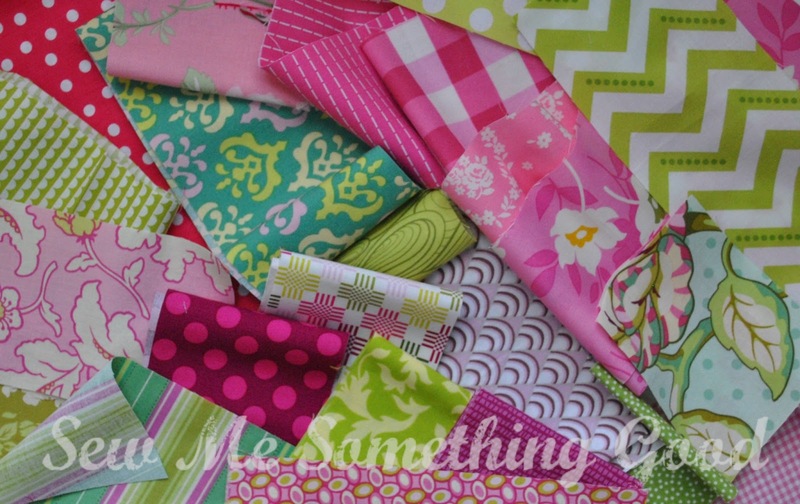 Sew Mama Sew Giveaway Day. 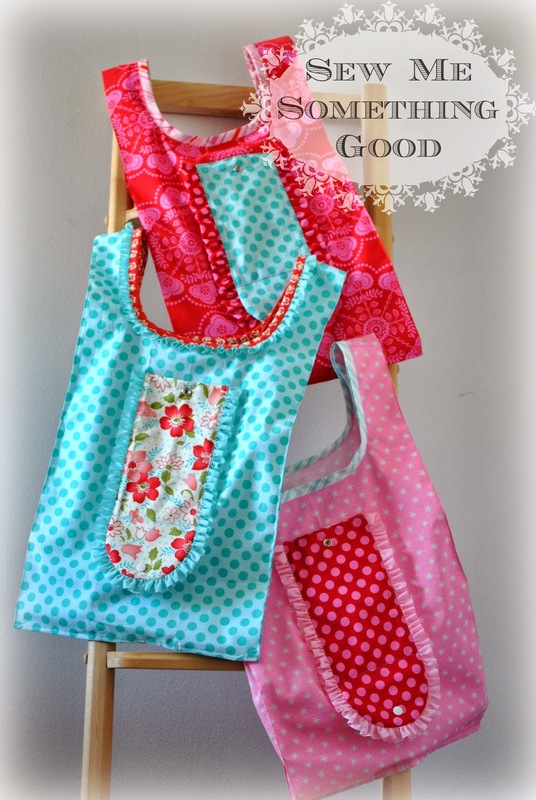 I enjoyed reading every comment (your comments will be of great help in my pattern writing). 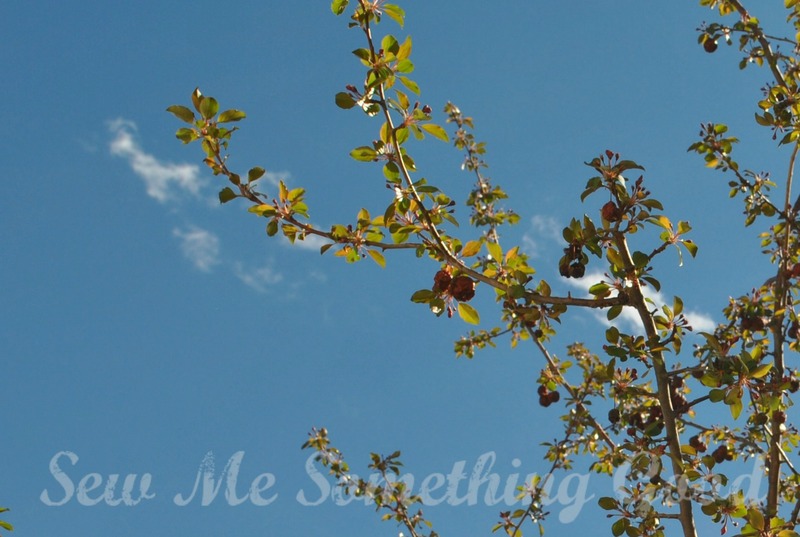 Plus, I now have a whole list of new blogs to visit. Yay! 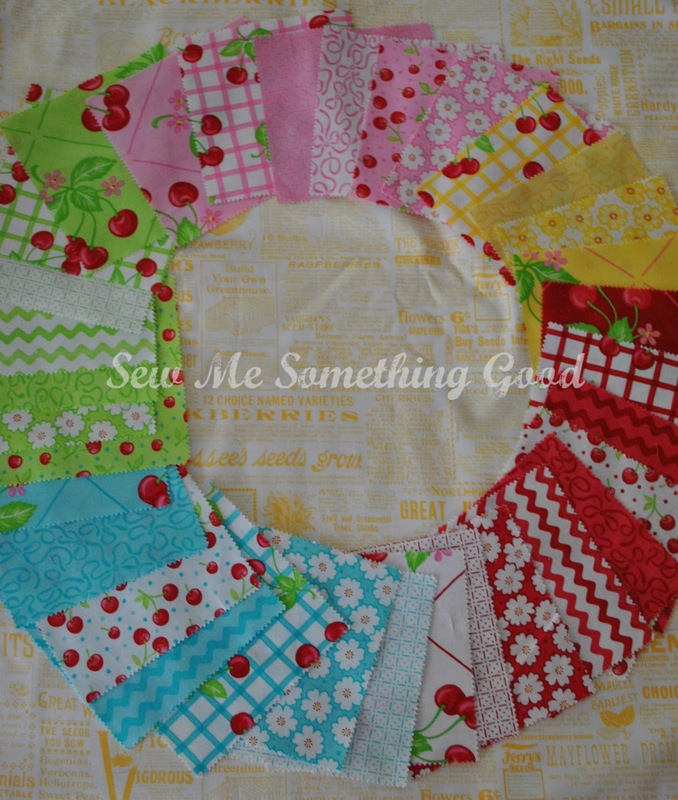 Pop Star Quilt is my version of Sarah Fielke's Made in Cherry Quilt. Truthfully, I never thought I'd be making a quilt using purple. 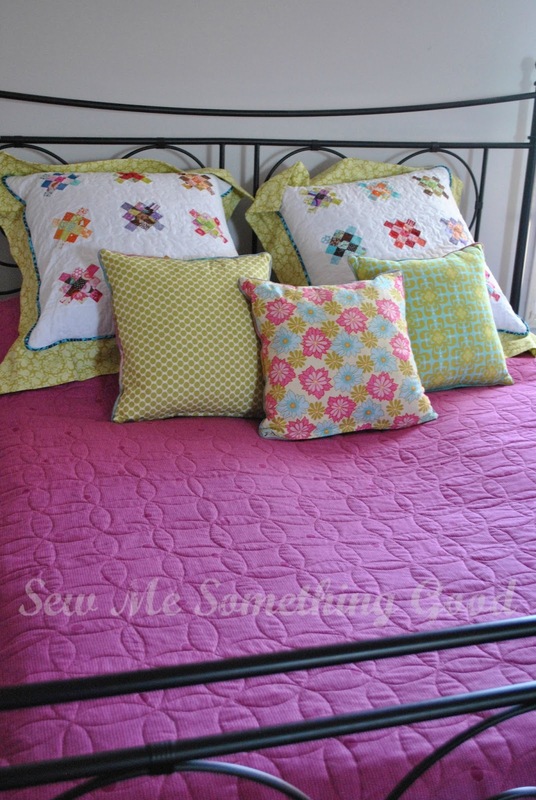 Honestly, it was Liz Scott's fabric line Domestic Bliss that lured me into working with purple and pinks. 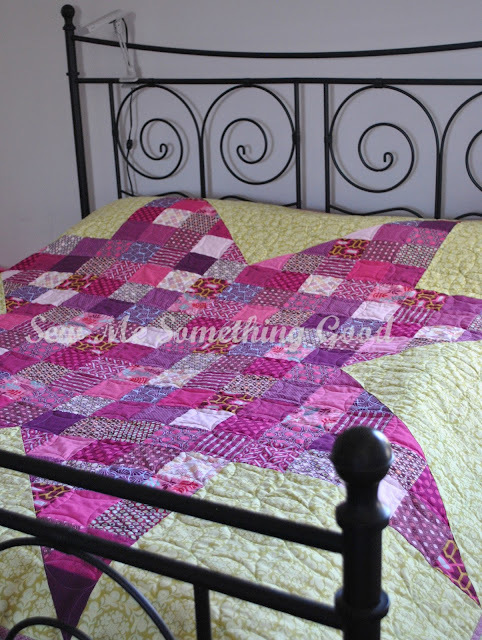 Taking inspiration from the palette in Domestic Bliss, I chose dark, medium and lights in pink and in purple to make my quilt. 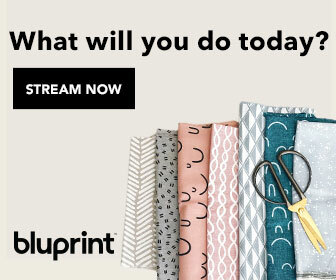 Originally, I even chose a background fabric that was teal (to be like this print from Domestic Bliss), but obviously, I changed my mind. Instead, I went with a bright, spring green (oh, I do love Henna Garden in any colour from Sandi Henderson). As much as I love the front of the quilt, I'm really crushing on the back. For the backing fabric, I chose Denyse Schmidt's Ladder Dot in Fuschia (see how nicely it goes with the fabrics in the quilt top? 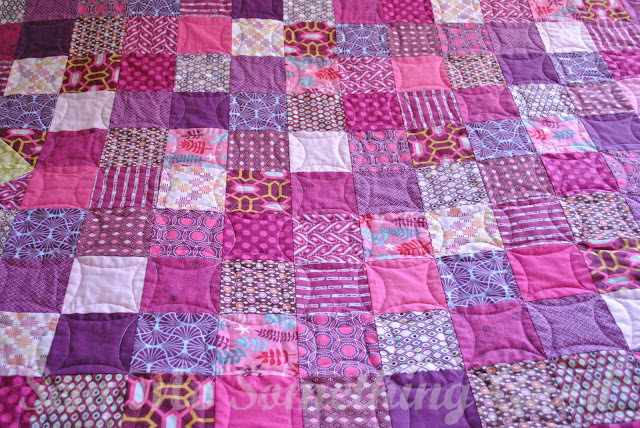 that was pure luck, as I chose everything separately online over the course of a year as I collected fabrics to make this quilt). The colour is just delicious! 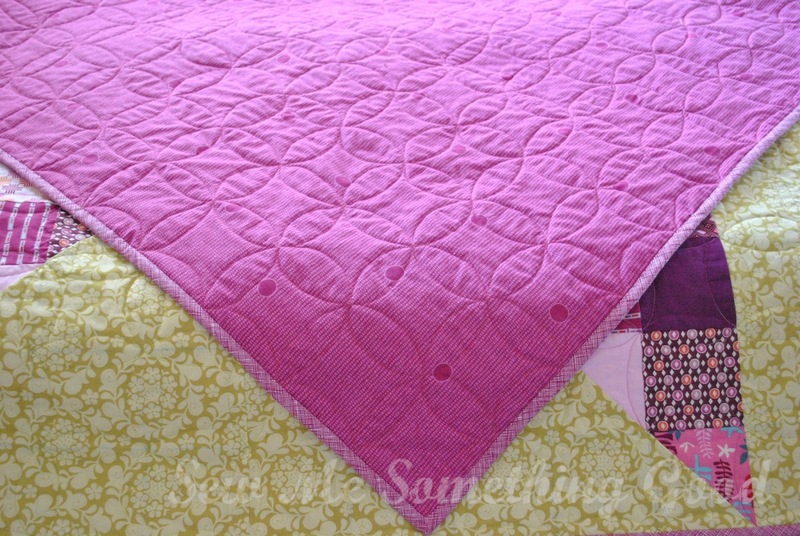 It also complements my free motion quilting! 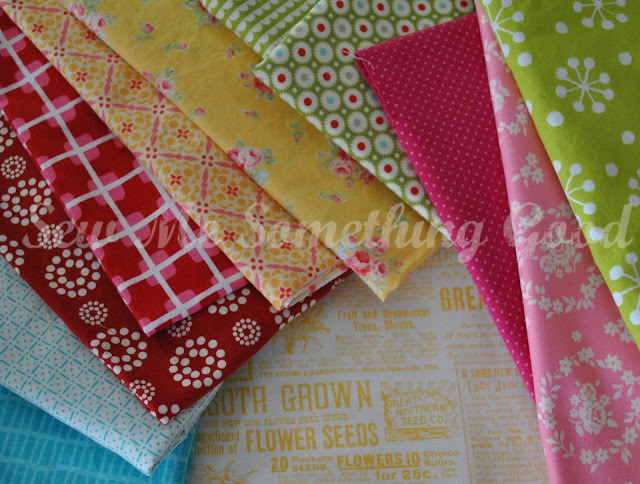 However, I was stuck for awhile, trying to figure out what to chose for a binding fabric. Then it hit me... Crosshatch in Plum from Carolyn Friedlander's Architexture line. It would be perfect! Right?